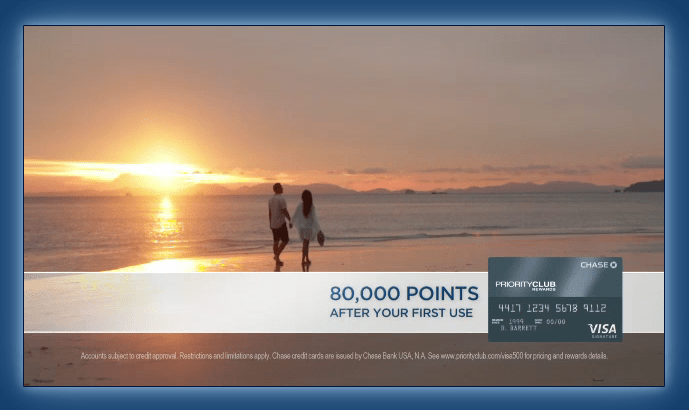 From a frugal travel perspective, well for me anyway, the best deal going is the Priority Club Pointbreaks nights promotions. As I blogged about Monday, you can do Stay-cations or longer trips as well and save yourself a TON of points at nice locations worldwide or close to home. So can you get a weekend for free? YES via e-Rewards. Now they are an invite only survey site but if you sign up with all the airlines and hotels and car rental places to get their marketing info via e-mail, very soon you will find from one of them an invitation to join e-Rewards and will get a 500 point bonus for your first survey. 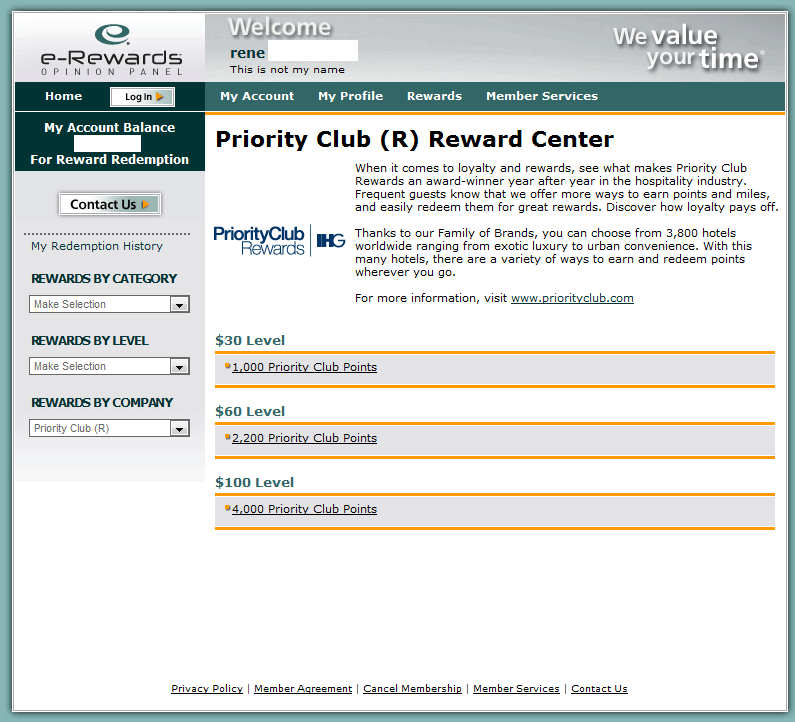 Then, it will just take some of your time to earn $100 in e-Rewards that you can trade for 4000 Priority Club points! Is this the best value of these rewards? Maybe, maybe not. I asked once on FlyerTalk what FT’ers thought was the best use and most said HERTZ 500 points reward for $60 earned in surveys. I currently pick the 7000 HILTON points per $100 rewards as I am working on building up my balance there. I, as well as some of my fellow BA bloggers, also will save some to use for the US Air Grand Slam. But the point of today’s post is a free weekend, so stay with me for now. 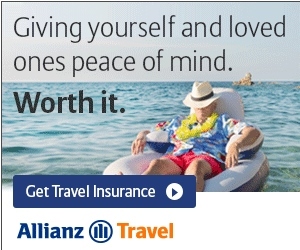 I get no referral credit for this card (there is a chance to get 80,000 points via this promo enter in promo code PGFTNHNAD3 but most get targeted for 60,000 but either way you may get 1000 points for watching the video – the exit link I received was this https://www.mychasecreditcards.com/ihg/inhotel80k ). I will have the PC Visa every year until the day I die unless they change the terms of this card. You get instant Platinum status, a free night certificate each year and 10% points rebate when redeeming points for stays. Wow! With this card your 2 night PointBreaks stay would just cost 9000 points. There are several promotions going that will get you the extra 1000 points missing if you just Google Priority Club bonus points. ← Yes another reason to always buckle up – Delta jets clip wings in JFK again! Totally agree. Headed for a staycation in Norfolk, VA in a couple of weeks! Priority Club always has several promo codes to register for as well! Its easy to get up to 10K, 15K, or more during one or more multi-day stays if you are aware of and sign up for these offers. @gussomer – great tip! Yes. Here is the link at FlyerTalk for all the current IHG promos! Just got the card for my mom – 80K after 1st purchase, no minimum spend, first yr $49 fee waived. Doesn’t get much better. Thanks!!! Has anyone used the link above to apply for 80k points? I wasn’t able to watch the video. It said my PIN and member number do not match but it does as I am able to get into my account at priority club website. Also, do i need to clear cookies first before i use the link above to apply for the 80k PC card?